We’ve learned a lot, it’s a great read and we’re sure you’ll learn a bunch, so lets hop right into it! Replacing résumé screening and interviews with skill testing so employers can see how candidates can do the job. Giving every candidate a chance to showcase their talent, not just the ones who look good on paper. Using machine learning to analyse how candidates complete tasks, and automatically ranking them based on how well they performed. We started Vervoe about two years ago… Now we have over 4,000 customers, we’re 25 people globally and we’ve raised US $4.5 million. How did you come to start Vervoe? 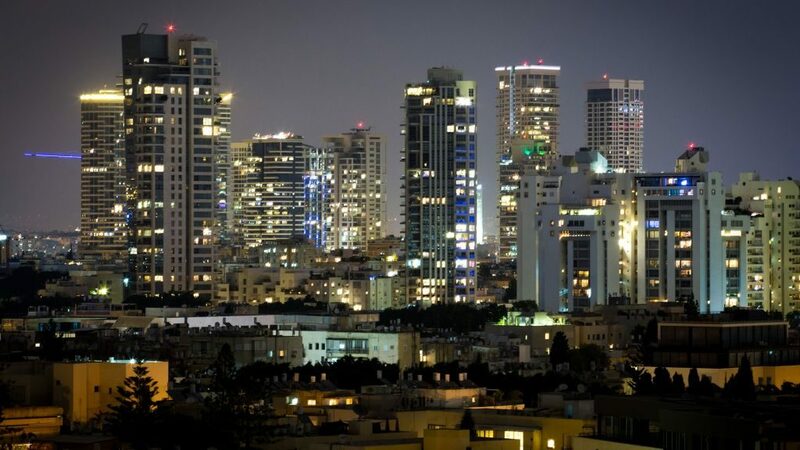 I grew up in Tel Aviv, which had a very entrepreneurial culture, and after attending the best school in the country and serving in the military as an officer I worked at a couple of startup companies. So I had a pretty good résumé. Then I moved to Melbourne where I applied for 100 jobs and couldn’t get a single interview. I didn’t have a degree, I was from the Middle East and my name sounded funny. I was basically disqualified because of my background, even thought I knew I was qualified. Years later I ran a large team and saw that the best people where the ones who were curious, team players, hard workers, out-of-the-box thinkers, and so on. Not the ones who had good grades, or had a logo on their résumé. My co-founder, David, had a similar experience in Silicon Valley where he had to compare Stanford grads to self-taught hackers. It was obvious to both of us that there is very little connection between pedigree and performance, so we decided to create a new way for companies to connect with candidates. We wanted to make it about whether someone can do the job, and nothing else. 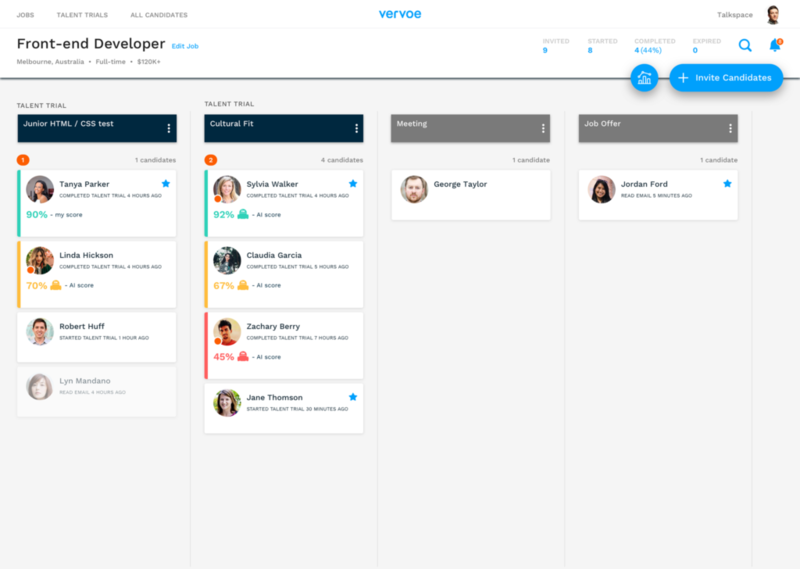 Is the Vervoe team local or remote? Why? Most of our customer-facing people – sales and customer success – are in the US. So are our advisors. 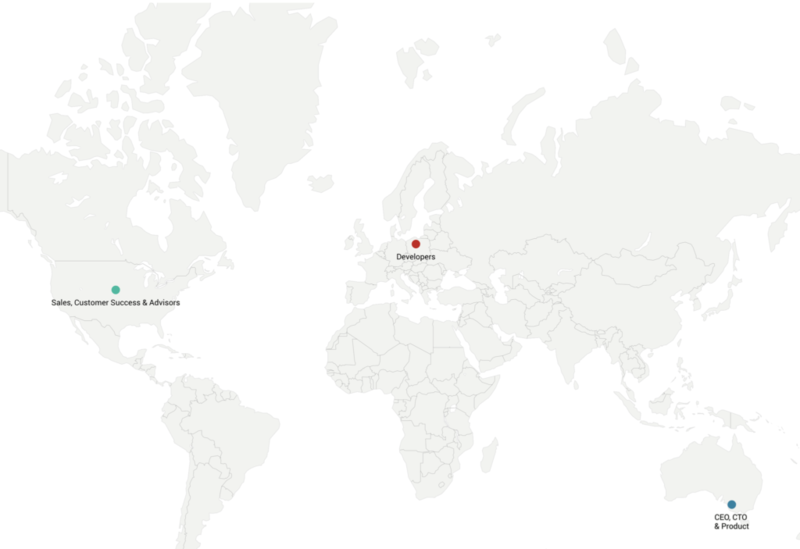 Our engineers are in Europe and the founders, plus our designers are in Australia. It’s crazy. It evolved this way because the founders live in Melbourne, and we wanted to stay there, but we focused on the US market and that led to a range of decisions around our sales and customer success staff. We initially decided to develop in Europe due to cost, but the availability of talent was quickly a factor as well. It was also very attractive to be able to hire people anywhere. We try to concentrate people in “centres of excellence” so to speak, so that people aren’t alone. We like them in groups of 2-3 at least because it fosters collaboration. We’ll eventually have 4-5 key locations and that’s it. What does your schedule look like on a typical workday? I wake up at 6am, sometimes at 5am (but ideally not). I spend most of the morning on the phone to the US. I walk the dog every morning and I’m always on the phone, usually to our sales team in California. Then I come home and have breakfast, and either take sales calls from home, or go straight into the office. Three days a week I pick my son up from childcare around 5pm, so I leave the office early. I usually work until about 10:30pm. Some nights I have late calls with the east coast so I stay up until 1am or later (not ideal). What tools and apps do you use to manage efforts across the team? We don’t really use formal tools to keep track of small tasks. We tell people what they need to do, and trust them to do it. People who can’t be personally accountable don’t tend to last long at startups, so we test for that when we hire. How often does the team have meetings? What are they and how long do they last? Ideally never. We had a weekly executive meeting for the company’s leadership and we even cancelled that. We talk to each other all the time and jump on a call whenever we need to. Formal meetings just drive people crazy. How do you see the future of AI affecting your startup? We’re kind of creating it rather than being affected by it. We already use machine learning to automatically grade, and rank, candidates based on how they perform tasks. We’re working on a range of natural language processing (NLP) features to deliver more insights to our customers. We’re also automating the way testing content is created, so imagine you just describe your ideal candidate and software spits out the perfect test. What’s the thing that you do best, and how did it come in handy while building Vervoe? I’m good at seeing people for who they are, knowing how to vet the best out of them and rallying them to work together towards a common goal. I build teams from scratch based on a shared sense of purpose and values. And I invest in our people all year round. How many days a week do you work? How many hours? How come? I work 7 days a week, and I work 12-18 hours on weekdays, plus a chunk of hours on the weekend. One reason is that I love what I do and I deeply believe in what we’re building. Co-founder & CEO is not exactly a chilled role. The other reason is that I live in Melbourne, our engineers are in Europe and our sales team – and most of our customers – are in the US. What about a typical weekend? Saturday morning is totally a work morning because it’s Friday afternoon in the US. I’m usually on the phone all morning. Then I spend time with my family. On Sundays I spend a few hours writing and catching up on things so I can hit the ground running Monday in a more proactive way. Do you have any “life hacks” that you attribute to your success? Things like Caffeine intake, meditation, l-theanine, exercise, journaling, etc? One of the things that made me a better CEO was to take a vacation and completely switch off for nine days. I empowered the team to make all decisions and turned all my apps off. I was hiking in Utah and totally uncontactable. All that happened was we had our best week in the company’s history, and I came back completely refreshed. So then I realized I don’t have to go back to all the things I was doing. I can just trust the team more and be more strategic. And, be more relaxed. 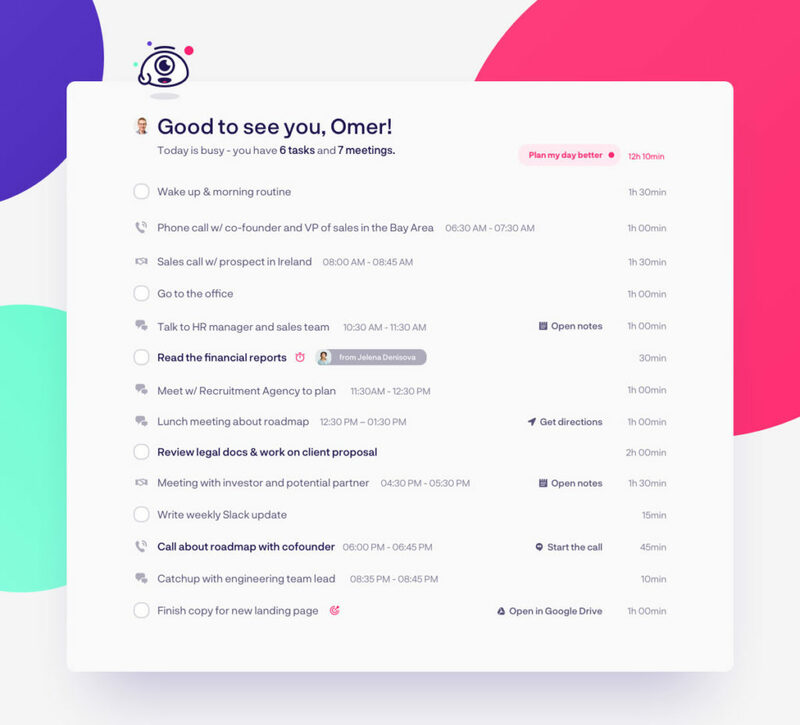 Skyrocket your productivity with the world’s smartest task management app. What are some of your regular habits which you cherish? For me the daily habits are walking my dog, drinking coffee and picking up my son from childcare. Not sure they’re applicable to others. I used to meditate and it totally cured my insomnia. I stopped, but that’s the only habit I could credibly recommend to anyone else. The other thing I’d recommended to founders is to surround yourself with people with positive energy. What’s your favorite book and podcast? Why is it your favorite? Favorite book: The Hard Thing About Hard Things by Ben Horowitz. Best raw, unfiltered perspective on what it’s like to be a CEO. 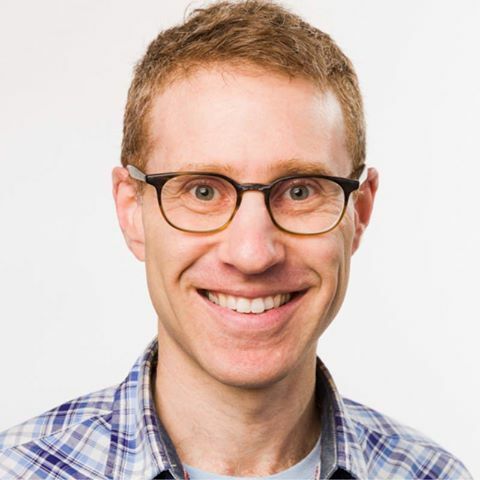 Favorite podcast: Saastr with Harry Stebbings – Awesome interviews with top people in Saas who genuinely share their knowledge. How do you measure your success every day? I only do something if it meets one of two criteria: it can move the dial for the company, or I’m the most skilled person in the company at that particular task. Ideally the second one will eventually disappear. So the way I measure myself is whether I move the dial for the company every day. I think of my job as having three major components, tell our story to the world, build a great team and never run out of money. I’m a growth marketing nerd with a passion for growing companies. At work, I dream up & implement highly innovative and scalable growth solutions. In my spare time I 📖 about neuropsychology and how things work.